We were driving into the dusty, rocky driveway of Greenwood Farm. Horses were following the car with their eyes, neighing. Horses of black, chestnut, bay and pinto were lining the stalls of the big main barn that was connected to a huge indoor arena and cozy club room. "You must be Ally!" A lady with hazel brown hair put into a ponytail, shook my hand. "My name is Mrs. Hailey. The owner of Greenwood Farm! It's beautiful here isn't it?" I nod and smile. " Today you are riding... Cloud! I'll show you where he is." Mrs. Hailey shows me where Cloud is. 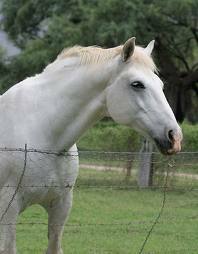 He's a gorgeous white gelding. Tall and proud. I could tell he was a Warmblood. Muscly and strong. Mrs. Hailey cleaned and tacked him up for me. I strapped on my helmet, and mounted Cloud. He was a lot taller when you were on him then on the ground. I grabbed a big chunk of his mane and started to pet his strong neck. "He's a big one huh?" Mrs. Hailey asks me from down below. I nod and tighten the reins. "I checked his girth and its nice and tight and the stirrups should be good." She reassures me. I smile and squeeze the gelding's sides to walk onto the rail. I was worried about the distance from the saddle to the ground. If I fall it'll feel like skydiving from a horse! I take a deep breath and tighten the reins in my hands and Mrs. Hailey tells me to trot. I squeeze Cloud in the sides again and he starts a smooth, big-strided trot. 20 minutes later she tells me to walk and then canter. I kick Cloud hard with my left leg and he drops his head, then canters. His mane is flying and it's amazingly comfortable. "Gorgeous!" He sounds like a dream to ride! :) I like the phrase skydiving from a horse!